Inter-borough bus service, HOV3 on the Williamsburg Bridge, and the 14th Street busway are all off the table. The MTA confirmed on Wednesday that L-train repair work endorsed by Gov. Cuomo will cause serious disruptions — undermining the agency’s denials that had been exposed in Streetsblog’s earlier scoop. The city and MTA will nix the inter-borough shuttle buses and surface-level improvements such as the 14th Street busway and Williamsburg Bridge HOV3 restriction that had been created for the now-scrubbed 15-month complete shutdown. The L train will keep running all day and night between Manhattan and Brooklyn — as the governor demanded — but service will be greatly diminished on weeknight and weekends as the MTA works to repair Hurricane Sandy damage in the Canarsie tunnel. On weeknights, service between Manhattan and Brooklyn will begin to slow just after the evening rush, at 8 p.m. Headways will grow to every 20 minutes after 10 p.m. — the current arrangement between 1:30 and 5 a.m. Weekend service will be significantly diminished, with 20 minute headways — up from as little as four minutes now. Trains east of Lorimer Street in Brooklyn will run with 10-minute headways all weekend and after 8 p.m. on weeknights. There will be additional service on the G train, but the train lengths will not be expanded. MTA Managing Director Ronnie Hakim told reporters that the agency is currently convinced that more night-and-weekend mitigation isn’t necessary because other subway lines will be sufficient to replace enough L train trips. But the MTA may change the plan after upcoming public meetings. Only one bus service improvement is certain: Hakim said 14th Street buses will run every three minutes on weekends, up from the current range of four-and-a-half minutes to seven-and-a-half minutes between buses. But the previously planned dedicated busway is no longer in the works, and the launch of M14 Select Bus Service, originally scheduled for April, has been delayed. The MTA may add more nighttime bus service on 14th Street, but will not be providing shuttle buses between the boroughs. “At this point, we don’t anticipate closing 14th Street to vehicles, but we do anticipate working with NYPD in making our bus lanes … work as efficiently as possible,” Hakim told reporters. Hakim did not confirm whether stations at First and Third avenue will become “exit-only” due to large crowds that are expected to gather on the platforms because of the extended headways. She said only that the MTA “may” make those stations exit only. To avoid crowding at and around the Bedford Avenue station, the MTA may provide shuttle bus service linking the Bedford Avenue L stop; the Lorimer/Metropolitan stop on the L and G; and the Marcy Avenue station on the J and M lines. Wednesday’s announcement matches up more or less with documents leaked to Streetsblog and Gothamist three weeks ago. At the time, transit officials claimed Streetsblog’s reporting was “irresponsible” because it was based on “draft and outdated reports.” The agency claimed the story did a “disservice to New Yorkers and our customers who need reliable, official information.” Then the MTA failed to invite Streetsblog to the conference call that basically confirmed the very reporting that it had publicly disputed. Tunnel repairs will begin at the end of April, as previously planned. The MTA has yet to determine how long those repairs will take. L train ridership remains high well into the night and early morning. Huge headways are likely to result in severe over-crowding, which may cause wealthier riders to opt for for-hire vehicles. 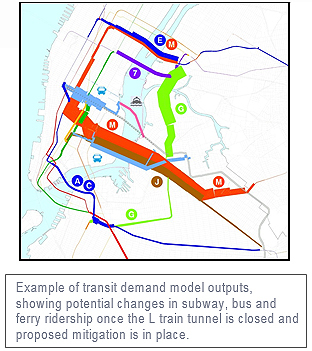 The MTA could not provide any information on potential negative impacts on surface-level traffic. Activists blasted the news. Transportation Alternatives was more succinct. “Mayor de Blasio’s new plan on 14th Street could be summarized in one sentence: ‘City to bus riders: drop dead,’” the group’s advocacy director Tom DeVito said. Update (5:31 p.m.): In a statement provided to Streetsblog, de Blasio spokesperson Eric Phillips said the future of the 14th Street busway, HOV3 restrictions, and other street redesigns tied to the L-train shutdown is as-yet-undetermined. This has all the makings of being a FUBAR situation. Gonna be awesome when de Blasio is at some meeting in Iowa talking about what a good manager he is and meanwhile 14th Street is wall-to-wall traffic and honking. There’s only a few small stretches of red on 14th st now. Is that what NYPD is supposed to enforce or is DOT going to expand those before April? This sounds like every other inbound train will discharge at Lorimer, likely flooding the station with riders. I guess the idea is that people will head to the G rather than wait for the next L train that will continue to Manhattan. Or will they avoid getting on that train in the first place, and wait for a Manhattan-bound train that they won’t possibly be able to squeeze into? Or maybe so many will be scared away that crowding won’t be an issue. Yeah, this will definitely be a disaster. I just hope no one gets killed. Still whining over this? Waahhhhhhhh………hopefully the majority of the population will move back to Ohio and take their funny accents with them. It’s amazing how politicians will try to move the earth and the sea to avoid the slightest restriction on cars. I’m sure the people who live in East New York and Canarsie and rely on the L Train appreciate you painting them as whining transplants, troll. Most absurd is the delay in implementation of an SBS on 14 th street end to end . This was slated for April, it is standard treatment and would allow camera enforcement . DOT , Why not ? DOT began installing the busway before Governor Cuomo canceled the full L shutdown — now its future is uncertain. Exit-only stations, massive crowds and scrubbed buses are part of the now overnight and weekend fix. A senior lawmaker threatens unilateral action if the MTA and DOT don't heed community calls for better transit mitigations during upcoming tunnel rehabilitation. Here we go, transit nerds: The full MTA/DOT L-train release!